Happy New Year! Because of your generosity over the holidays, many in our community were warmer at night, children had holiday dreams come true and there was food on the table that might otherwise not have been available. Thank you for the donations and the time you took to volunteer over the holidays to help people who truly needed it. Unfortunately, the needs will not stop after the beginning of the New Year. We sincerely appreciate when you remember AZCEND throughout the year. If you haven’t yet taken advantage of the AZ Qualifying Charitable Organization Tax Credit, simply do so before doing your taxes, April 17. Here’s how it works: State taxpayers who contribute to AZCEND can receive a dollar-for-dollar tax credit through the Qualifying Charitable Organizations Tax Credit. To qualify, couples filing jointly can receive up to $800, and single taxpayers can receive up to $400. This is in addition to the school or foster care tax credits you may already do. Please consult your tax adviser for more information. Please join us at our inaugural Eggs Benefit friendraiser and fundraiser breakfast sponsored by Dignity Health, Wednesday, January 24 at Alamo Drafthouse Cinema – 4955 S. Arizona Ave., Chandler, AZ 85248. Registration begins at 7:30am and the program begins promptly at 8:00am. We’ll share how our programs and services change lives for people in crisis and assist to stability, and ultimately to prosperity. If you have not had a chance to hear about us firsthand, we would love the opportunity to share our impact with you. Everyday, when people come here to volunteer or make a donation, they often say they had no idea we did all of these services. We are a one stop shop. You will have the opportunity to hear from a person who has received our services and feels it has changed their life. Space is limited. Please call Dara today to make a reservation at 480-963-1423 ext. 108 or email dara@azcend.org. On December 21 the first night of winter, we held our first walk to end homelessness. With over fifty people in attendance, Chandler Vice Mayor Kevin Hartke spoke, we served hot chocolate with homemade cookies and the marching band from Chandler High School performed for us. Our walk was in recognition of the people who have lost their lives due to homelessness and how we are working to end this. We recognize the need to help end the cycle of homelessness. Thank you to our supporters: Safeway, Starbucks, Double Dozen Donuts and our donors who graciously gave scarves and gloves for people using Chandler I-HELP (Interfaith Homeless Emergency Lodging Program). Again please join us at our breakfast! We hope you are joining us Saturday October 14th for the Spirit of AZCEND Gala. It promises to be a great evening as we honor Lori Dayton with the Tracey Washington Spirit Award. Tickets are still available at https://azcendgala.eventbrite.com. This past week in a partnership with Maricopa County Safe Kids, Chandler Fire Health & Medical and Target, we were able to provide forty eight new car seats FREE to families. Each family participated in a car safety presentation to receive a car seat. The Family Resource Center delivered an energetic SUPER WHY CAMP to children ages 3 – 6 years old to help them learn numbers and letters. The program’s content is drawn from the PBS show SUPER WHY. On October 24th from 10 am to 6 pm AZCEND will partner with Chandler Gilbert Community College to host Empty Bowls. At this event, art meets hunger, compassion and advocacy. Talented artists create beautiful ceramic bowls and offer them for a small contribution of $10. All donations benefit AZCEND. We are grateful to our soup and bread partners; Dilly’s Deli, Liberty Market, Even Stevens, Panera Bread, Chik-fil-A and Buca di Beppo. As the holidays approach many families rely on your donations to make the season a much brighter time. 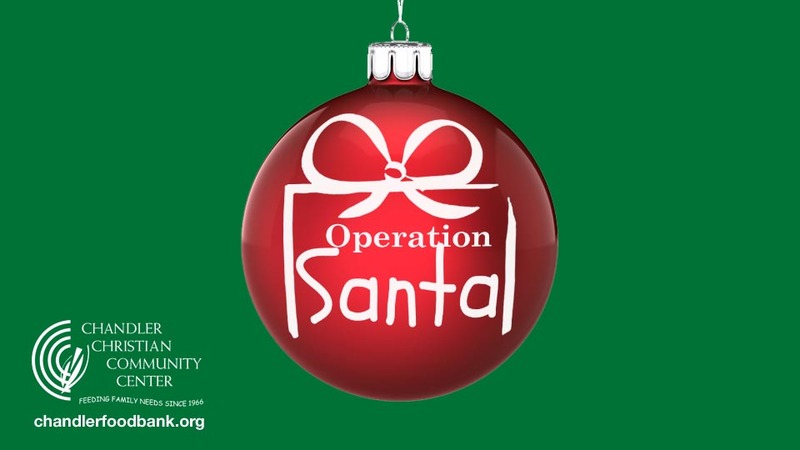 The process for Operation Santa is where families can register to acquire gifts for children seventeen and younger, October 17 through October 31. Toy distribution will take place mid December. For more information please contact Yessica Munoz, 480-963-1423 ext 106. Also with the holidays, extra donations are needed for the food bank. In addition to monetary need, our families need turkeys, chicken and hams. Side dishes requests are mac and cheese, instant potatoes, cranberry sauce, green beans, corn and gravy. Please remember ready to eat food with pull top lids for people experiencing homelessness. Your donations to the Food Bank and Operation Santa help make the difference to a family who may be struggling. Donations can be made at www.azcend.org/causes/donate. Sometimes we at AZCEND wonder about the courage it takes someone to come to us for services. We know each person has a personal story as they walk through our door to receive assistance to move from crisis to stability. We are grateful for supporters like you who know there are many vulnerable people who need these services and programs. Because of your compassion we are able to provide those services. THANK YOU! The Family Resource Center (FRC) provides early literacy/kindergarten readiness instruction, parent education and other services families need to support their children’s optimal health and development. Last year, 1,291 individuals received health and wellness checks. In partnership with the Arizona Diaper Bank, the FRC provided 1,464 packages of emergency diapers. FRC offers “Giggles, Squiggles, and Squirms,” a fun, interactive early literacy program designed to prepare families for their children’s entrance into kindergarten. Child Watch is an innovative program that provides a safe environment for children to play and learn while families receive AZCEND services. Parents must remain on the premises and sign children in and out. Child Watch served 1,018 children last year and is on course for many more this year. Each year, AZCEND’s Operation Santa program provides holiday assistance to children throughout the community. This past year, 738 children received toys, books, candy, and more. Donna Beedle serves as the Family Resource Center Manager. Donna oversees FRC services and programs. Donna is also the primary contact for individual donors and companies who want to adopt a family for Operation Santa. Yessica Munoz is the Family Resource Center Navigator. Yessica assists with Operation Santa, administers the diaper bank program and provides case management services to AZCEND families. 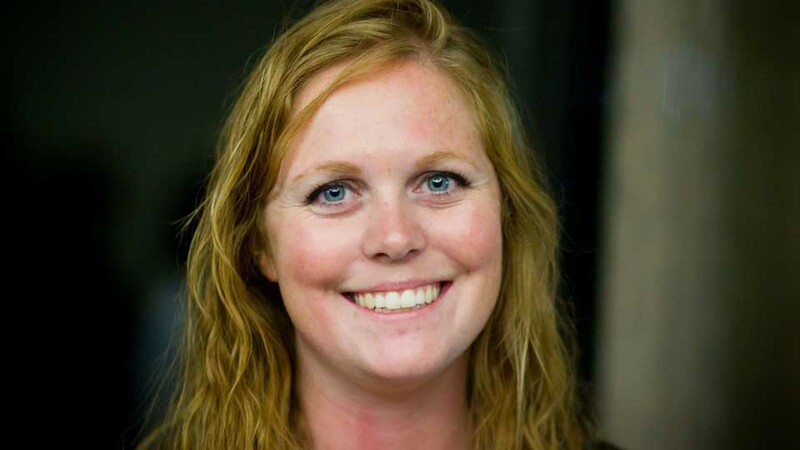 Samantha Witter is the Family Resource Coordinator. Samantha coordinates parent/family classes/activities and outreach initiatives including AZCEND’s Advocacy Council. She also assists with Operation Santa and registering families for the program. Edith Morales and Leslie Peralta serve as Child Watch Monitors. They teach and take care of children in a safe and fun environment while parents receive AZCEND services. We are proud to announce Lori Dayton as this year’s recipient of the Tracey Washington Spirit Award. This award honors those who have dedicated the time and energy to serve people in need in our community; being a positive role model and embodying our core values of integrity, compassion, hope, excellence and respect. Lori’s service to AZCEND and the community embody those principles we hold in the highest regard. We are excited to honor Lori with this award named in honor of Tracey Washington, she certainly symbolizes his spirit. Lori has volunteered with AZCEND for fifteen years and worked directly with Tracey. Her integrity and compassion for the people we serve has always set an excellent example. Lori’s life work has been serving people and our country with twenty one years in the army as a nurse. She is an animal lover and has had several rescue dogs. She treats everyone with respect, and has been a champion for our organization and in her church where she serves as an elder. Lori has given more hours than we could ever imagine. We are so pleased to honor her with this award. Please join us as we celebrate Lori at our annual Spirit of AZCEND Gala on October 14 at The Falls Event Center, 4635 E. Baseline Road, Gilbert, AZ 85234, 6:00pm with dinner and silent auction, we will also hear a heartfelt testimonial from a person who received services through one of our many programs to assist them from crisis to stability. We are sure you won’t want to miss this celebratory evening. Mahatma Gandhi said “The best way to find yourself is in the service of others.” Tracey Washington knew that value of service as does Lori Dayton. If for some reason you are unable to join us at our Gala please consider making a donation to one of the many programs and services we offer. Patrick is an Home Delivered Meals (HDM) participant who has not been able to be independent due to paralytic syndrome. He has been confined to a wheelchair and he is not able to go places on his own. When one of the Gilbert congregate participants donated a motorized scooter, Patrick was one of our participants that we contacted to see if he was in need of a scooter. He was excited about the possibility of receiving the scooter. Our Activities Specialist, Amanda Shepard, and HDM driver, Dan Vega, delivered the scooter to Patrick. He now has the freedom to do errands on his own. He goes to nearby stores, he takes the trash to the trash bin and is able to give his dog a ride. Patrick appreciates the home delivered meals and now the opportunity to be more independent. I-HELP, the Interfaith Homeless Emergency Lodging Program, offers shelter and meals every night of the year for adult individuals experiencing homelessness. I-HELP partners with faith-based organizations, community agencies and local businesses to provide these services, in addition to showers, transportation, wellness classes, health checks and other resources. A requirement of I-HELP is for each guest to engage in Case Management, enabling each person the opportunity to exit homelessness. During the fiscal year 2016-2017, 428 individuals were provided with 8,523 bednights and over 17,000 meals. Over the same time period, 258 I-HELP guests engaged in case management, with 97 gaining employment and 67 entering housing. The success of I-HELP would not be possible without the incredible network of community volunteers who contributed over 14,600 hours for the fiscal year. The I-HELP Case Manager, Daniel Albertson, directly assists the I-HELP guests by connecting them to vital resources, including housing assistance, job placement, medical referrals, benefits connection such as SNAP & AHCCCS, and any other help needed to break the vicious cycle of homelessness. Priscilla Acero, the Case Manager for the Tenant Based Rental Assistance (TBRA) program, works to ensure self-sufficiency for formerly homeless individuals who have entered housing through TBRA. Priscilla also works closely with I-HELP staff to determine housing eligibility for I-HELP guests who are actively engaged in case management. Bill Rotondo, the I-HELP Coordinator, oversees the coordination of services offered by community partners and volunteers, while building community connections with local businesses, houses of worship, and community agencies. Bill works to increase awareness about the program and to recruit new partners to become part of the I-HELP network. Martha Myers, the CAP Programs Manager, supervises the Community Action Program (CAP) and I-HELP. Martha works to ensure that no one is left without the vital resources necessary to their specific situation. 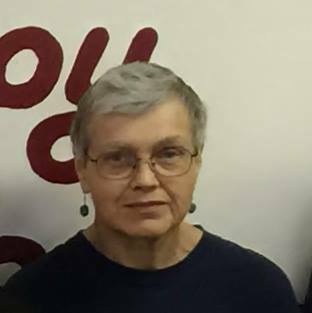 Martha oversees the operations of I-HELP while working to expand the services that are offered. Volunteer opportunities for I-HELP are intake volunteers, drivers to help transport the I-HELP guests and drivers to pull the Chandler Clean Machine. For more information on volunteering with I-HELP, contact Bill Rotondo at bill@azcend.org. Thank You Body Envy Fitness! The need for diapers is always at a high at AZCEND on Tuesdays and Thursdays. Experiencing a shortage on certain sizes, Eric Gelder and some of the participants at Body Envy Fitness helped by organizing a diaper drive to help! They were able to help us tremendousing with sizes 4-6 which are highly requested. Thank you to Eric and all the ladies who helped with the donations! Bob Newman has only been volunteering at the Gilbert Senior Center for the last 8 months but in that time he has made a big impact on us! Bob was initially looking for something to do a couple times a week so that he could get out of the house. Although he is scheduled for neck surgery 8/24, he has assured us that as soon as he is able, he will call us to get back to active duty. Many of our volunteers take time off during the summer leaving us with lots of gaps to fill and we have used Bob as a fill in for practically everyone who volunteers! He is always willing to learn a new position. Bob has run the sign-in desk for lunch and has also called bingo on Fridays for us. The bingo players loves his big boisterous voice! Bob we can’t thank you enough for all that you do for us. Your support helps us accomplish our mission. This summer, AZCEND was overwhelmed by the amount of teen volunteers that gave their time to the organization! Some coming to finish a days worth of community service hours and others even coming in regularly every week! It is always great to see youth getting involved in their community and driven to help those in need. AZCEND wants to thank Cody Butler, Andre St. Clair, Chancellor Marshall, Darren Rose, Gavin Vogt, and Travis Zhang for giving 10+ hours to our organization and the many others who came through for school. We can’t thank you enough! School is back in session for most school districts in our area. We participated with the Operation Back to School that reached over 3,000 area students to help them prepare for a successful start in school. With students returning to school many children now will have lunch included as part of the daily routine of school but many families are still struggling at home to feed everyone. Please share with people in your community that we have food for families and an extra supplemental food day on Fridays. We are preparing for our Annual Gala. Mark your calendar and plan to join us for this celebratory evening. It will be October 14 at The Falls located on Baseline and Greenfield at 6:00 pm. This year we will begin a heartfelt tradition with an award in honor of Tracey Washington who worked at AZCEND for 14 years. Tracey dedicated time and energy to those in our community had a tremendous respect of people needing support and showed a strong commitment to serve people, he acted as a positive role model in all that he did. I encourage you to make a nomination for the Tracey Washington Spirit Award by August 18, the form is available here. The evening will include dinner, a silent auction, shared story by a client who has received services at AZCEND and how that assisted them from being in crisis to stability. Recognizing an honoree for the “Tracey Washington Spirit Award” and a night of being the spark of change. There are several opportunities for you to support our Spirit of AZCEND Gala: become a sponsor, buy a ticket to attend, and we are seeking to donate auction items. For more information on how you can be a part of the Gala please contact Dara Gibson our Development Director at 480-963-1423 ext 108 or dara@azcend.org. It will be an exceptional evening to celebrate the work we do at AZCEND for the people we serve in our communities and raise funds to continue all of our programs. Plan to join us. We are thankful for your support and so are the people we are able to serve because of your belief in our programs and services. Together, we give our children roots to grow and the wings to fly. 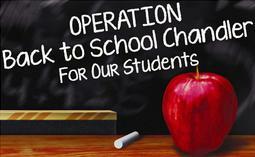 Heart-felt thanks to all who donated to our annual Operation Back to School Chandler. With your help, AZCEND, the City of Chandler and many other community partners presented more than 3,000 students with backpacks stuffed with school supplies. Students also received shoes, socks, uniforms and haircuts at value of $90 per student. It is an exciting kick-off to the 2017-18 school year as students leave the event with tools to be successful. Families unable to make it to the July 22 event and still in need of assistance can contact their respective school principals who will have limited supplies on hand. The reason I am writing this thank you letter is to express my greatest thank you so much to all the people involved in the Operation Santa program. I started coming to CCCC and CAP three years ago. We are one low-income family with a husband and father who supports the five of us. I have severe mental illness, and I’ve also gained weight due to the medication and inability to get adequate exercise, as I live with degenerative disc disease. In the past two years I wasn’t in time to do the point system, but signed up anyway. The kids just adored their gifts. This year I decided to get with the program and do the point system. I volunteered, got a credit report (which I thought was horrible and it turned out good) I started writing about what I was thankful for and began to think positively. I also lost 12 pounds, and although I have a long way to go, I’ve got a start. I get it now, what it means again to go out there and get involved. Kindness is contagious. I’m UP this Christmas (even though I don’t have less on my plate but actually more). I’m UP, and that is a good place to be. I believe the holidays from here on out will be better. PS I start a new job after the first of the year, and my back is good. FED EX (Chandler) collected and donated over 200 totes filled with baby food, diapers, wipes, and holiday food items. The 1,165 lbs of contributed items will benefit the CCCC Food Bank and will be distributed to children in need and included in Holiday Food Boxes. 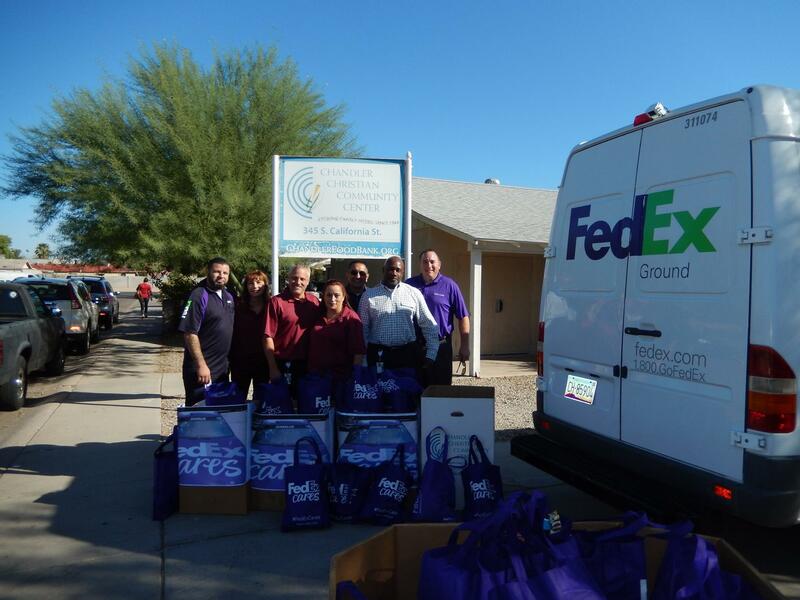 Congratulations to FED EX Chandler for collecting the most donated items of any FED EX location in Arizona! CCCC appreciates your work and generosity. Christina’s husband had struggled with alcoholism for some time. She worried that he would lose his job because of his drinking, as he was the sole breadwinner for her and their two young children. He ignored her pleas to seek help, however, and the quality of their family life was declining rapidly. Christina decided to come to Chandler Christian Community Center to seek help for her husband and to save her family. She met with CAP (Community Action Program) Case Manager, Maria, and shared her story. She was beginning to feel hopeless but repeatedly stated that she wanted to help her husband get into a rehabilitation program. The case manager provided resources to her, but during the next visit she reported that he had rejected the help. She knew that she needed to return to work and provide for her family, and soon after, her husband was fired after drinking on the job. His behavior became increasingly erratic, and fearing for the safety of her children, she asked him to leave the house and began her job search. As Christina set out to find employment, her car broke down. Obtaining transportation from a friend, she arrived at the CAP office in tears. She stated that her husband had been living in a hotel and had exhausted their savings. Worse yet, days earlier she saw him sleeping on a park bench near their home and asked the case manager what she could do to help him. The case manager explained that once her husband was willing to get help, he could overcome his alcoholism, but for now, she had to focus on the needs of her children. Christina prepared her resume, and was quickly hired for a job paying $15 per hour. CAP temporarily paid her car repair and child care expenses, so she could have reliable transportation to her new job. As a college graduate, she believed she could eventually do better than $15 per hour but was thankful for a job that began covering basic living expenses. In their most recent meeting, Christina shared with Maria that she felt empowered now that she is caring for her children’s financial needs. Her affect communicated a newfound hope and personal confidence. Not only did she gain employment, but she reported the great news that her husband has entered treatment for alcohol abuse. Christina is currently receiving case management as a working single mother until she attains self-sufficiency and no longer needs the program. My name is Kelly Delgado and I’ve been working in the Senior Nutrition Program for 16 years. This program is near and dear to my heart. Providing meals, socialization, exercise, special events and other activities to the elderly and disabled has become an important part of my life. In 2012, I was working as the Senior Program Manager when I heard the organization I was employed by needed to focus on other projects. They would no longer be able to provide the Senior Nutrition Program and CAP (Community Action Program) offices in Gilbert or Chandler. I was concerned for the participants and wondered what this could mean to my family’s finances. We were told the organization was committed to finding a home for our programs and hoped the transition would be a smooth one. That’s when Chandler Christian Community Center stepped in. CCCC interviewed senior center and CAP employees and hired us to manage the programs as we had been doing all along. The transition from one organization to another was seamless. Participants wouldn’t have known there was a change of organizations if we hadn’t shared the information with them. No one missed a meal; we didn’t stop activities from happening, CAP services were still provided every day and employees never missed a paycheck. It’s been four years and I am proud to say CCCC is committed to the people it serves as well as its employees. CCCC has invested and supported me to become a better manager and helped me realize I am a leader in the community. They encouraged me to join Gilbert Leadership and have provided hours of staff development and supervisor training. CCCC also makes every effort to shop and provide affordable benefits to its employees and their families. CCCC’s mission is to change lives by nourishing minds and bodies to create a connected, thriving community; that’s exactly what CCCC has done for me! Thank you CCCC for protecting the Senior Nutrition Program, all the support you provide in the community and for giving me new opportunities. I am forever grateful!